On Monday, we had a train trip through the bottom of the Royal Gorge which I strongly recommend. It departed from Canon City. The Royal Gorge Route Train has three classes: Vista Dome which we took, Sunshine Falls Bar and Parlor Car, and Coach. The Vista Dome has comfortable seating and panoramic windows, but I would suggest sitting in the coach and heading for the open outdoor car for the best photographic opportunities. The Vista Car is $59 for adults and the Coach car is $35. The train runs at 9:30 a.m., 12:30 p.m. and 3:30 p.m.. Each of these trips lasts two hours. The 6:30 p.m. trip is three hours long. For those who want to dine on board, they offer pricey gourmet breakfasts, lunches, and dinners. For example, lunch in the vista car adds an additional $40 to the fare. Special trains are their Polar Bear Express, Oktoberfests, and ones for Easter, Mother’s Day, and Father’s Day. 50 feet wide at its base and a few hundred feet at its top. It has a depth of 1250 feet. This is one of Colorado’s deepest canyons. You’ll find the views stunning. What you’ll see are numerous rafters taking on Class 4 rapids, lone kayakers, and the beautiful Royal Gorge Suspension Bridge. A photo stop is made close to the bridge’s underside where the gorge narrows to 30 feet. Stay alert and you might spot deer, goats, mountain lions, eagles, or blue herons atop their nests. Part time narration occurs during the first half of the trip and attendants are close by to take care of passengers’ needs. No narration occurs during the return trip so that riders can concentrate on the scenery without interruption. The train has a history worth relating. With the discovery of silver and lead near Leadville, Colorado in 1877, a race occurred between the Atchison, Topeka, and Santa Fe Railroad and the Denver and Rio Grande Western Railroad to obtain area access. Normally having two trains on nearby routes would not cause a problem, but the gorge was too narrow to allow this. This created the Royal Gorge Railroad War for two years. Notables such as Doc Holliday and Bat Masterson were on the side of the Santa Fe while the Rio Grande’s treasurer hired 60 gunmen to combat them. Finally the federal government led by railroad baron Jay Gould prompted the “Treaty of Boston” to end the fighting. The Denver and Rio Grande completed its line and leased it to the Santa Fe for1.4 million dollars. In 1989, the Rio Grande merged with the Southern Pacific Railroad. The combined company became the Union Pacific in 1996. In 1998, the Union Pacific sold 12 miles of track through the Royal Gorge to preserve the scenic route. Two new corporations, Canon City and Royal Gorge Railroad and Rock and Rail Inc. joined to form the Royal Gorge Express. Passenger service, which continues today, started May 1999. The train runs 5 to 17 cars and operates year round. The Vista Dome car we rode in once was used by Westours (A name associated with Holland America Cruise Line) on the Alaskan Railroad. The locomotives came from the Union Pacific and Chicago and Northwestern Railroad. The Coach cars are dated from the 1950's when they were part of the Canadian National Railroad, used in transcontinental runs. Reservations are vital for this train trip. This can be done at least a week in advance to get the class of service and seats you desire. But we were able to make our reservation Monday morning when the ticket office opened without any problems. The train was not sold out. On Wednesday, July 18, we visited one of the highlights of our trip to Colorado Springs. If you come to this city, take two hours and visit this attraction. It is a must. Located in the historical part of the city, Old Colorado Springs, sculptor Michael Garman has created the genius of Magic Town. 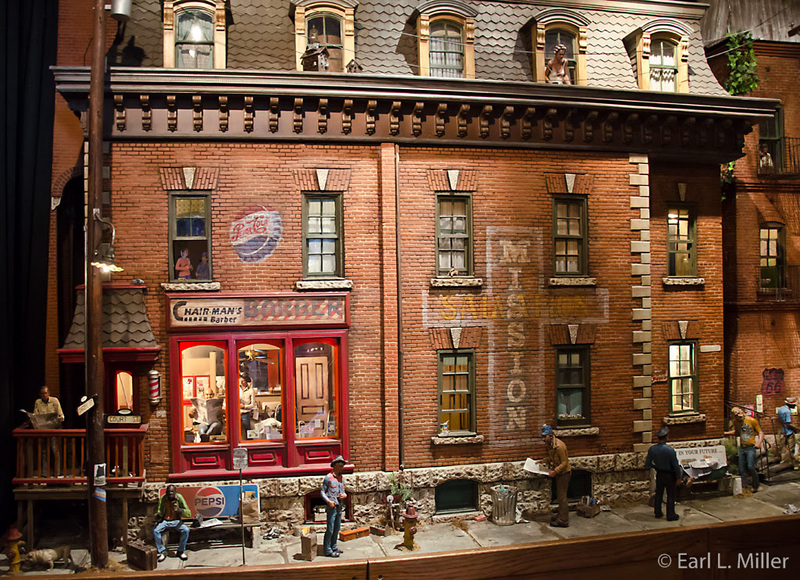 Imagine a miniaturized neighborhood of 19 buildings and 500 sculpted figures from all walks of life, even figurines of dogs, and cats, filling two rooms. It’s a neighborhood from the 1950's to 1960's that could be Anywhere America. It was built piece by piece more than 35 years and at a cost of over a million dollars. A lot is from his photographic background and the people he knew. In this 3,000 square foot exhibit, you’ll find bars, hotels, restaurants, a television appliance shop, a salvation mission, even the Crown Cinema with the film “Stagecoach” on its marquee. From a lineman climbing a pole, someone sticking his head out of a sewer hole, bartender serving drinks, two lovers on a park bench, and a crowd standing on a corner - it’s like sensory overload. Even better, it’s not a static display. It includes the use of a DVD to project holographic images onto invisible mirrors in the walls. Scenes morph into different views. We had the good fortune of learning this superb sculptor’s story. Before viewing the scenes, we watched the video of his life story. As an 8-year-old Texan, Garman began sculpting his figures from pipe cleaners and fashioning backgrounds for them to inhabit. He was fascinated with the art books of his father, who was an artist. Michael especially enjoyed books on anatomy. A young Garman after high school went to Mexico with $35 in his pocket. He thought his trip would last two weeks, but he stayed two years touring several Central and South American countries. During this time, he fashioned coarse sculptures from Mexican clay which he sold door-to-door in small cities and towns. He discovered his talent in sculpture after talking his way into free admittance to the School of Fine Arts in Santiago, Chile. Soon he accumulated enough cash to return to the United States. By the early 1960's, he realized how talented he was and returned to Dallas. There he developed marketing skills. Being a huge fan of John Steinbeck, he decided he wanted his figures to tell stories. When he sold one of his characters, part of his story was then missing. Also, he believed art is not a luxury for the rich. He wanted his sculptures to be affordable rather than available solely for a wealthy collector or seen only in an art gallery. He decided not to sell his originals and learned how to cast. After a year, devoted to doing theater in San Francisco, his famous city scenes started to take place in his mind. He heard that buildings were to be torn down in Philadelphia and moved to that city to study its old buildings, architecture, construction methods, characters, and residents. Street people and their way of life became very important to him. In 1971, he moved to Colorado Springs where he had a small studio above a drugstore. He started selling his “Frontier Series” on western life but his success was minimal. When he started casting in his basement, sales took off. He went to shows - some years as many as 17. Then he opened his present studio, museum, and retail store and made his residence above the store. He has sold to such heads of state as Ronald Reagan and George Bush and such celebrities as Bob Hope and Clint Eastwood. 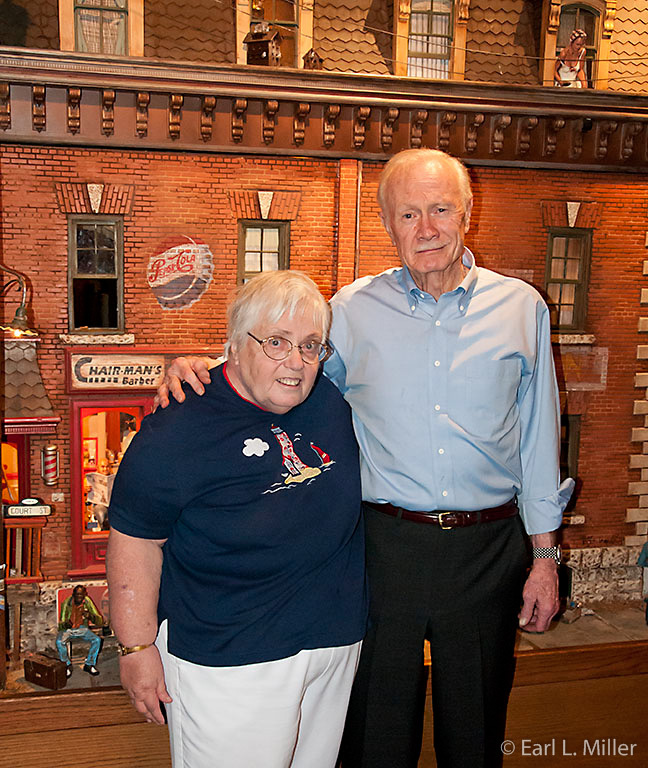 After touring Magic Town, take time to discover Garman’s figures that are for sale. From linemen to golfers, cowboys, and more, you might find something you want to own. And if you’re lucky, like we were, you might even have a chance to meet and talk to Michael Garman as you tour his establishment.